Zienia Merton passed away on Friday, 14th September, aged 72. She began her acting career in 1959 as a 14-year-old shot into space for the Children’s Film Foundation movie serial Masters of Venus. 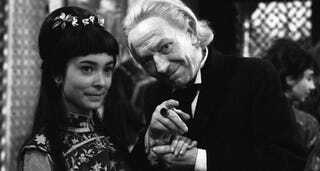 Five years later, she would become the reluctant bride Ping Cho in a seminal Doctor Who serial, Marco Polo. However, you might recognise her better as Moonbase Alpha team member Sandra Benes from Gerry Anderson’s Space 1999. Born in Burma, Merton was raised in Singapore, Borneo, Portugal and England. Her performance in Doctor Who is lost bar the soundtrack but an impressive array of cult television and film credits followed. She was a priestess of Khali seeking Ringo Starr’s finger in the Beatles movie Help! and played Christina in the Denis Potter adaptation of Casanova. Other appearances include Catch Us If You Can, Grange Hill, The Six Wives of Henry VIII (Merton reprised the part of Annette for the movie Henry VIII and his Six Wives but this was cut from the film), The Chairman, The Benny Hill Show, Jason King, The Indian Tales of Rudyard Kipling, The Adventurers, When You’re With Me, Strange Report, Angels, Tenko, Dempsey & Makepeace, Hammer House of Mystery & Suspense, Return of the Saint, Bergerac, Lovejoy, Dinotopia,Crime Traveller, Doctors, Casualty, EastEnders, The Lakes, Wizards vs Aliens, Judge John Deed, The Bill, Wire in the Blood, and Coronation Street. And of course, she returned to the world of Doctor Who as a registrar for a two part installment of The Sarah Jane Adventures. Another marriage that wasn’t meant to be.